The reveal video got released this morning. So far the map design looks really good. Hamada and Panzerstorm look like nice big Battlefield maps. You beat me too it. Looks niiiiiiice. Can’t wait to wreck with the bren. Definitely gave me that vibe as well. The aerial view of Twisted Steel reminds me of Operation Market Garden too. I wonder if they will ever release a map that you can just level completely. I'm not a fan of all these maps like Aftermath from BF3. Details and short clips about each map in the “News” section. The maps just look insane beautiful! The customizations are clearly toned done/made more neutral and "accurate" for this trailer, hopefully we will have a (payed) option to not see inaccurate customizations at launch to keep it looking something like this. Honestly? Great trailer, can't say anything bad about how the maps look aesthetically. Dang, that's an awesome video. The closer it gets, the more excited I get. 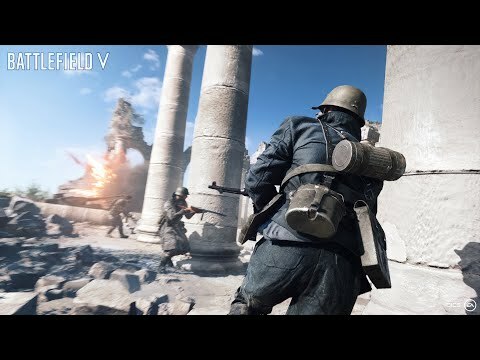 BFV has caught a lot of flak, but I've never stopped being excited for it. Almost all of the comments I've read have been positive. I think this video is turning it around for Dice, I just hope they can keep it moving in the right direction. Add to that the Saving Private Ryan moment(s)/WW2 vibe people were asking for and you have a winner. Giving people what they want always works ..
Can't wait to play on the bridge on Twisted Steel. Finally a bridge that's not a death trap and that's big enough to actually offer some cover and allows us to move around. I'm usually not a fan of bridges in BF but this one looks fun. The community has scrutinized Dice/EA on just about everything on this game, so they could have found something. Just imagine if there would have been a couple shots of over the top customization or a bland looking shot of one of the maps. I think they hit it out of the park with this trailer and am glad to see the positive response. Absolutely not. You should NOT be able to turn off customizations. That was a very exciting video. I had a few quibbles with what I saw but overall BFV looks really good. I was surprised at how authentic and realistic BFV seemed. The distant tracer fire exchanged in the opening scene on Hamada looked fantastic, and the sniper and half-track near the end was very cute. One quibble is how firing guns looks a little bit underwhelming. I like guns to feel kind of vicious and murderous when I fire them in terms of the sound and fury of them. For me it makes combat in a game more personal. There is also something about the hit markers that seems to be either slow, soft, or both. I like the hit markers to feel very snappy. There were at least a couple of scenes, one in a hangar where a player was shot on a walkway and also another scene in a room where a player fired a shotgun, and in each instance I felt the hit markers and the shotgun reticle were naff to the point of drastically affecting gameplay. Does Hamada remind anyone else of a Bad Company 2 single player missions called 'Sangre Del Toro'? If they ask money for that option, they still get the money they need for the " free" DLC and everyone can have the game looking how they want. And not ALL customizations have to be turned off, more the model World of Tanks uses: everything inaccurate or wacky can be hidden. So if you buy and use accurate combinations, you can still show of your great customizations. Oh, there are still people that are mad about not everything being there at launch. Premium being gone and missing armies and using less known smaller battles andwill dislike the trailer. But there will be less dislikes with this trailer because ofthe more WW2/Saving Private Ryan moments and lack of (focus on ) controversial customizations. So who watched that trailer more than once? I watched it once on my phone and then I had to watch on computer with speakers. Later when I get home I will watch on my tv with full surround sound. Hyped!! Cant wait to be the first into the hangar on Aerodome and launch the panzerfaust into the planes...race you there!